According to me, this transitional weather can be really challenging when it comes to dressing up. These past few days have been as if the weather is undergoing through an identity crisis. No longer summer, not yet winter, still at one hour of the day you'll feel like pulling out a sweatshirt to protect you from those strong winds & when you move out wearing it you'll be welcomed with a bright sun. So, what should one do during this period? Out of all the check patterns, Gingham has always been my favorite. So the other day I decided to try on some layering tricks with a Gingham print smock dress. 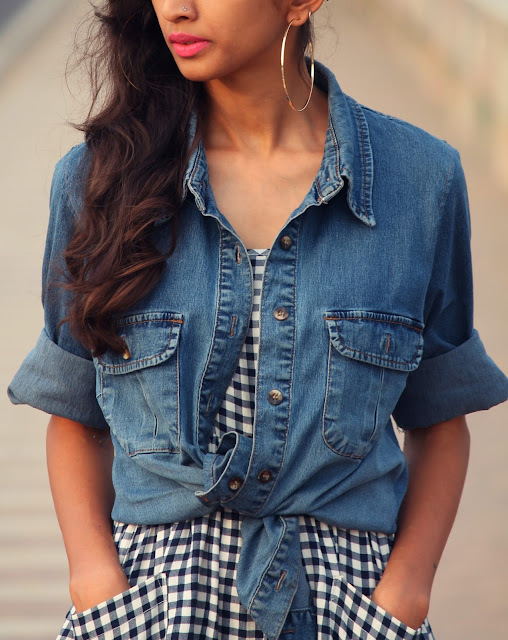 Wore a denim shirt over the dress with a knot at the waist, which gave a retro twist to the attire! I remember starting my love for fashion with a traditional outfit, and call it serendipity that the first post here is also on the same lines. Indian weddings are all about grandeur, be it the venue, the food or the outfit that one wears. When it comes to what I like to wear to a wedding, the answer is a 'contemporary ethnic outfit'. It should be traditional but with a modern touch! 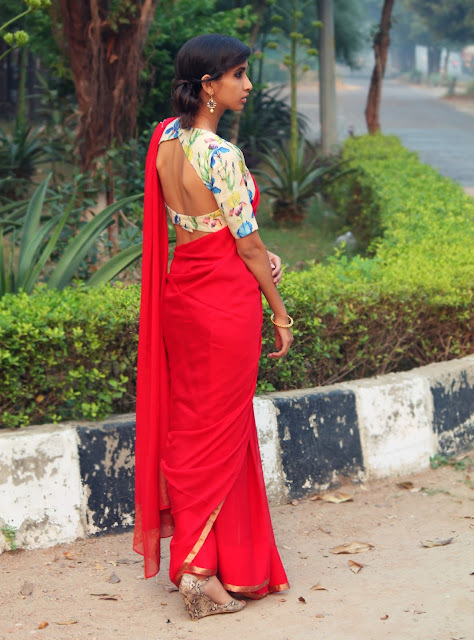 I wore this Crêpe saree in red with a thin gold border. While the color red gave the perfect festive tinge, the simplicity of the saree made sure that I can experiment with the blouse. Floral print in Indian wear is one of the blooming trends, now a days. Pairing up with a floral print blouse gave a refreshing feel to the whole outfit. These dainty chandbalis perfectly complimented the blue tulips.